This Is Getting Old: Feelin the Power! Halak and the Canadiens' stellar play in Games 6 and 7 left many scratching their heads as to how to beat them. One sure way is to convert on every single (yes, every one of them) powerplay given to you. That is exactly what the Pens did, going 4/4 on the powerplay on their way to chase Halak from the goal and route the Canadiens 6-3 in Game 1 Friday night. This was an incredibly balanced performance, with 13 different Penguins scoring points. It was also quite surprising how relatively easy it looked to beat the "unbeatable" Halak at times. After an early Montreal goal by P.K. Subban, the Pens answered quickly on their first powerplay of the game. Sergei Gonchar blasted one from the point that deflected off of a Montreal defenseman and beat Halak to tie the game. 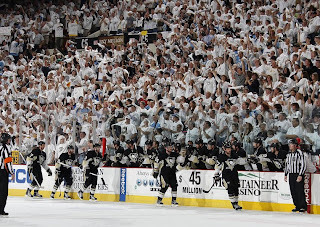 Jordan Staal gave the Pens a 2-1 lead when he picked up the puck and carried it in front of Halak before beating him and sending Mellon Arena into and uproar. Staal's goal happened once again on the mad advantage, making it 2/2 at that point in the game. It would not be long before they got yet another opportunity as well. Kris Letang slapped one in from the point at the beginning of the second period to give the Pens a 2 goal lead and their 3rd PP goal of the game. The Canadiens would cut it back down to 1 later in the period on a goal from Mike Cammalleri, but Craig Adams and the Pens would answer quickly with a beautiful tic-tac-toe play and their only even strength goal of the entire game. The Pens would make it a perfect 4/4 when Alex Goligoski beat Halak to give them an commanding 5-2 lead in the game. Brian Gionta would score one more for Montreal and Bill Guerin added an empty netter to seal the game. This was an incredibly exciting performance from the Pens, but it was not without cost. Jordan Staal left the game in the second period and did not return. It is unknown what his injury actually is (believed to be something with ankle or foot) and how long (if at all) it will sideline him. The Pens looked just as good as where they left off last Saturday in their comeback win in Ottawa, and appeared not to have missed a beat in their near week long layoff. What is most important for the Pens now is to try to keep their play at the high level it is at right now, and not fall into the same trap as Washington did by counting out the Canadiens. It is only Game 1, and there is a lot of hockey to be played. 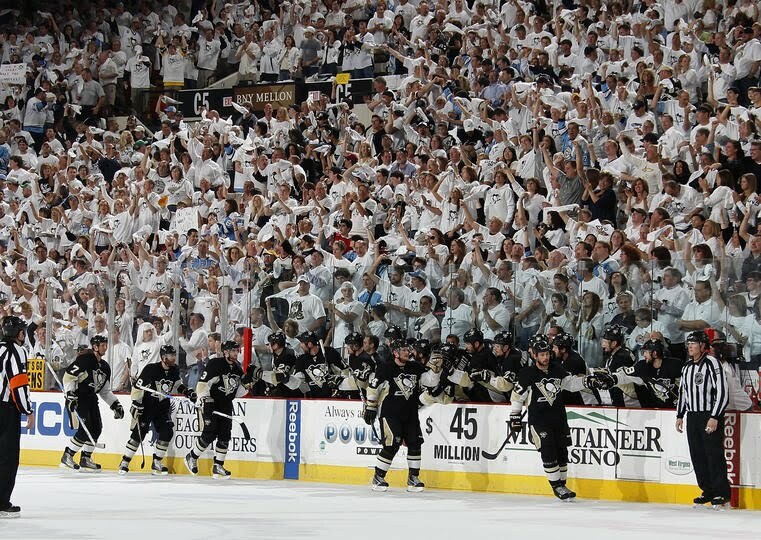 But at this level, it appears the Pens are certainly on the right track to another good series.